﻿ January 2019 Marketing and Holiday Planning » Red Mango Marketing! January is the start of a new year which is a great time to implement positive changes in your business. Now that the holidays are behind us, take some time to think about your 2019 goals and action plans to make them a reality. 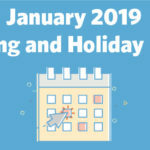 If you’re looking for email ideas for January, the January 2019 Holiday Planning Infographic will help you launch your email marketing efforts into the New Year! The post January 2019 Marketing and Holiday Planning appeared first on Constant Contact Blogs. This entry was posted on Friday, December 21st, 2018 at 9:37 am	and is filed under Email Marketing, News & Updates. You can follow any responses to this entry through the RSS 2.0 feed. Both comments and pings are currently closed.